In 2017-2018 the Office for Budget Responsibility (OBR) expects that tax revenues will be equal to 37% of national income. 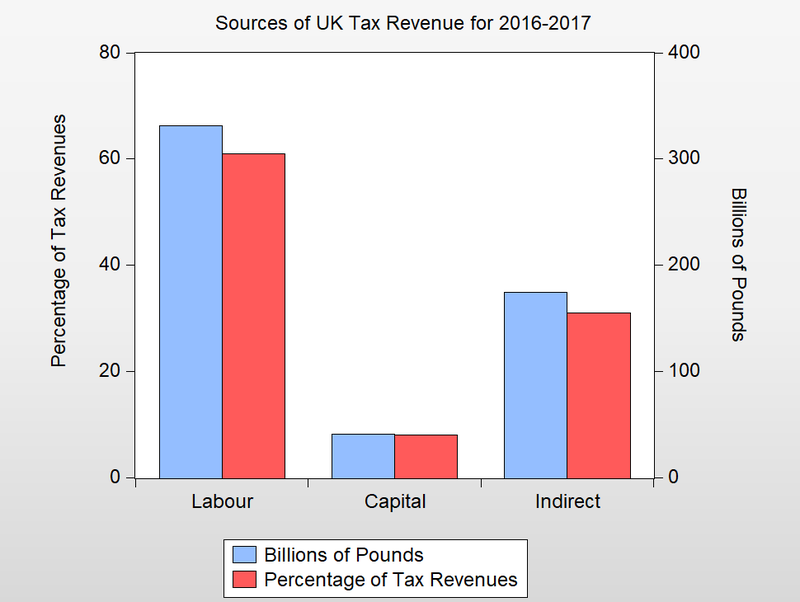 Chart 1 breaks this down by whether those revenues came from taxes on labour, capital or sales. The UK generates approximately £1.9 trillion in income of which 2/3 is paid as wages and 1/3 goes to the owners of capital in the form of profits, rents, dividends and capital gains. If tax revenues were raised in proportion to these two sources of income, we would expect that the revenue raised from capital should be approximately 1/3 of the revenue from income taxes. In reality, taxes on labour income account for 61% of tax revenues and taxes on capital for only 8%. To put my proposal for a wealth tax in context, let me revisit some of the principles of the public finances. For at least two hundred years, there has been a public consensus in favour of progressive taxation. In other words, a rich person should not only pay a higher amount in taxes; that person should also pay a higher percentage of his or her income in taxes. That principle is encoded into the current system of income taxation whereby those earning less than £11,500k pay nothing and those earning more than £11,500 pay income tax at a graduated rate. That rate increases in steps with the highest rate currently set at 45%. So far so good. But there is a growing consensus that the very wealthy are not paying their fair share. The offshore schemes unearthed in the recent Paradise Papers scandal, may all be legal. But to many, they do not seem just. It is relatively easy to raise taxes from wage income. It is much harder to raise taxes from capital income. Suppose that you own shares in a company that pays little or no dividends. The company nevertheless makes a healthy profit that it reinvests. Because you receive no dividends, you pay no income tax. But because the company is profitable, its shares keep appreciating and, when you sell those shares, you will make a capital gain. Currently, the maximum tax you will pay on that capital gain is 20%. The very rich earn little of their income from wages and thus the top marginal rate of 45% never applies. The Office for National Statistics estimates UK wealth to be roughly £9 trillion of which £3.5 trillion is in the form of factories and machines and £5.5 trillion is in the form of property. The Institute for Fiscal Studies (IFS) estimates that 40% of that wealth is held by the top 5% of wealth owners and 20% is held by the top 1%. £9 trillion generates an annual flow of income of roughly £450 billion. 40% of £450 billion is £180 billion. Assuming that the top five percent of wealth owners are in the 45% tax bracket, one could argue that the Chancellor should be receiving an income of £81 billion from those individuals. My proposal is more modest. According to my calculations, a wealth tax of 1.2% levied on net assets greater than £700,000 would raise approximately £43b in revenue, enough to replace existing taxes on capital and still have £2b to spare. I chose a threshold of £700,000 because the IFS estimates that it is the cut-off for the top 5% of the UK wealth distribution. A person with net assets of £700k is at the 95th percentile and his or her assets would, under this plan, be tax free. There is, of course, no need for a new proposed tax to be revenue neutral. A tax of 2% on net wealth greater than £700k would raise £72 billion and allow the Chancellor to lower the top rate of income tax on earned income or to fund important spending programmes such as defence, education or health care. Any major tax reform is likely to have unforeseen consequences and this plan is no exception. One major change from existing policy is that the wealth tax I am proposing would apply not only to wealth held in the form of factories and machines, but also to wealth held in the form of residential property. Currently, those with net assets of £700,000 or more own property worth £2.2 billion (40% of £5.5b) for which they are receiving no income. It is likely that a wealth tax would provide incentives to convert housing wealth into income earning assets. That would put downward pressure on property prices and increase investment in productive capital thereby making houses more affordable and increasing labour productivity at a single stroke. The British people are tired of austerity and there is a growing concern that our nurses, firefighters and police men and women deserve better. Mr Hammond, I respectfully ask that you consider my proposal for tax reform. It might just provide a simple and popular way to balance the books. <1> The three major sources of government revenues are pay as you earn (PAYE) income taxes, 20%, National Insurance (NI) contributions, 17.5%, and VAT 16.9%. Together, these three taxes make up 54% of all treasury receipts. To get to the labour tax data I added two-thirds of self-employment income and two-thirds of corporation tax. To get to the capital tax figure I added one-third of self-employment income, one-third of corporate taxes and all of capital gains taxes and inheritance taxes. The two-third, one-third division is based on the rough calculation that two-thirds of national income goes to labour and one-third to capital.